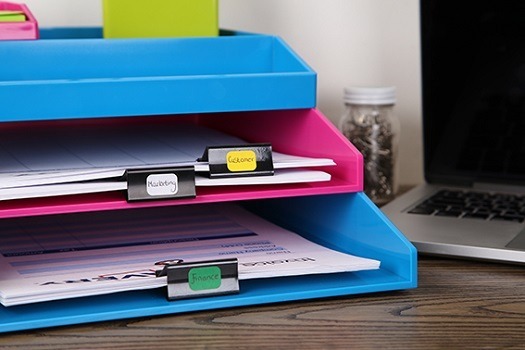 A new poll of 2,000 UK adults has discovered that eight in ten people consider tidying and organising to be a real stress buster – whether it be filing away important documents, having a pristine desk at work or labelling files and other items. As a nation, we spend an equivalent of almost eight days a year getting things in order at home and work – giving things a good sort through 27 times a month. Eight in ten UK adults admit they find mess stressful and 63% don’t feel on top of things unless their items are in the “right place.” But despite this, the research commissioned by Avery UK, also found 72% of Brits would describe themselves as messy. Fiona Mills, marketing director for Avery UK said: “We wanted to discover how people feel about tidying, and the study has revealed a true love-hate relationship. People feel better for clearing away the clutter, but certain barriers prevent the UK population from cracking on with it. 64% of those polled said that having an organised life helps general health and well-being so we needed to find some simple solutions. Crossing things off to-do lists is the aspect of organising we find most therapeutic, although putting together a to-do list is also a major stress buster. Other things we do to restore calm include tidying our desk at work, sorting out finances, doing personal admin. and organising our storage. Writing things on your calendar, emptying the dishwasher and sorting through paperwork at work feature too. The biggest barrier to being more organised is simply laziness according to those polled, although having too much work on and lack of time are factors too. Four out of ten said they simply don’t enjoy it. It appears that Brits feel shame when it comes to mess and prefer to keep it to themselves as the time we tidy most is when we are expecting visitors. However, lack of focus and feeling overwhelmed, as well as being quiet at work, can lead to a tidying spree as well. The survey carried out by OnePoll also found 62% of us wish we were better organised, while 36% revealed they can’t cope when mess becomes ‘too much’ to deal with. In fact, on average we can cope with mess for nine days before it becomes overwhelming. When it comes to the workplace two thirds would like their surroundings to be tidier. While around one third of those polled said they are more organised at work than at home, one fifth said they are more on top of things at home than at work. Katherine Blackler, professional organiser, and President-Elect of the Association of Professional Declutterers & Organisers said: “When I first meet a client I often see signs of stress from mess or clutter. They usually contact me because they are completely overwhelmed and simply don’t know where to start. Having systems and procedures in place to prevent clutter from building up will save you a daily battle so I help to implement processes that work for my clients.